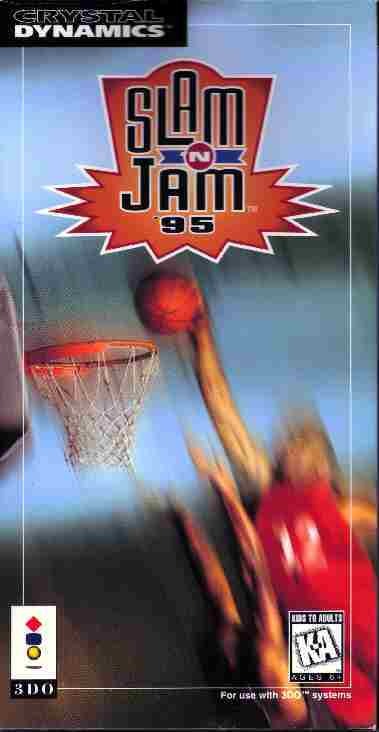 Slam n Jam is a fun basketball game. It has pretty good everything but great gameplay. Lately I have been without food, drink, and rest while I was being a slamin n jamin machine. I just keep playing and playing, for hours and hours, season after season. But finally I came out of my hole and up to tell you about it. Where to start? I could go on for paragraphs just telling you about how fun it is but I won't seeing that it would take days to read. But I will just say it is very fun and leave it at that. Crystal Dynamic, who made this game did a spectacular job and just added another gem to the 3DO's library. C. Dynamics has really impressed me with their games. Included in the options menu there is even a commericial with some of their games which is pretty cool. Overall the graphics are great. The players are large and they even have fascial expressions. The crowd is even visible! You can see them and everything. Also your guy throwing his arms up in victory and running off is cool or when he shatters the glass backboard is even cooler. Where as PlayStation there is just a jarble of polygons and no fascial expression visible and the crowd consists of some dots and a backdrop. Ahhhhh! Where as with sprites there is none of that colliding but instead nothing but smooth gameplay. 3DO really impressed me with this and I think its great. The commentary to this game is just spectacular! But after about 3 hours gets on your nerves and is also repititious. Grunts of player don't sound spectacular but serves a purpose. Basketball hitting ground sounds just as it should. I like the way the it sounds when the glass shatters. Little details like this really make the game shine. The way you can see who you are going to pass to is a big help. It's neat how you pass behind the back and do an alley-oop. Dunking is easy too which it should be. Also hacking some guy when he is jammin is easy which is cool because you get to see him fall in pain! Control is good! It's so fun! I love playing this game! It really take you in. Gameplay doesnt get much better than this. Very good. I'm gonna go back to playing this game I swear that dude on the other team is starring at me it's freaky! Or maybe it's lack of food, no wait it must be sanity right now.